CLAMP DIAMETER CLAMP DIAMETER 1,1/2" I.D. We couldn't find the P-Clamp type mounting brackets we really liked, that weren't flimsy and worked for us or most all applications, so we simply made them. We designed and manufacture these heavy duty ABS molded P-Clamps to secure almost anything from your UTV's roll bars. These clamps will snap around your 1, 3/4" roll bar(s), and then close and secure almost anything you want up to a 5/16" diameter bolt, we leave that up to you. You get a package of (4) durable 3/16" thick X 1" width P-Clamps with extended mounting tab. Tab closes to a 3/8" thick mounting surface! Simply install the P-Clamp by snapping it over the roll bar, then drill a hole anywhere on the tab that suits your mounting requirements and your done! The ABS material is extremely strong and reduces vibration and won't damage your painted surface like other clamps. 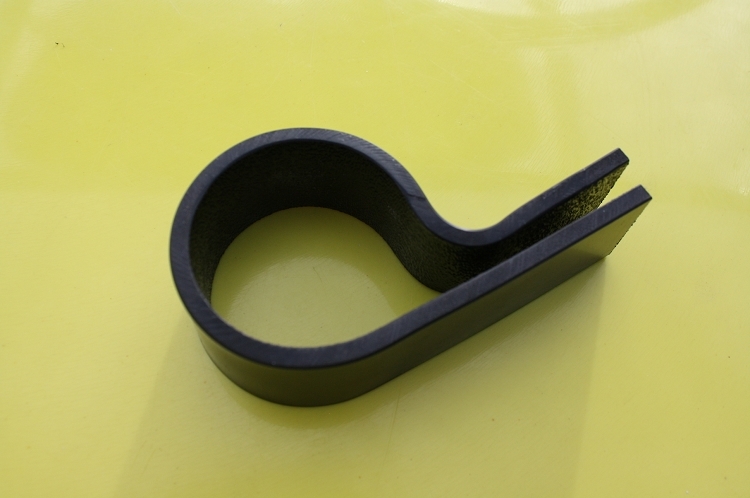 We offer a Lifetime replacement warranty of this clamp fails in any way due to manufacturing or usage. ( drilled holes most not exceed 5/16" diameter and must be placed in the center of the tab ).